The B-Blender is designed to attach to any U.S. made, or imported Bigsby Vibrato unit. 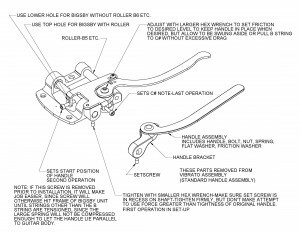 The U.S. made units just say “Bigsby”, while the imported units say “Bigsby Licensed “. It can be added to any guitar having a Bigsby Vibrato, without having to add holes, routing, or any changes to either the guitar or the Bigsby Vibrato which would be remaining after removal of the B-Blender itself. The B-Blender is furnished at the present time only in one configuration, which is polished stainless steel for the 2 larger parts, and polished aluminum for the bracket that attaches to the string shaft of the Bigsby vibrato. At this point, gold or black finishes are not available, nor is any left hand model. The main differences are that the diameter of the shaft, which the strings are attached to is 3/8 in. diameter on the US models, while the shaft diameter of the imported ones is 10mm, or about .019 in larger. This won’t matter, since the hole in the B-Blender attachment bracket is specially configured to attach firmly to either diameter shaft. The other difference is that the string spacing is 3/8 in. on the US models, and is 10mm on the imports. 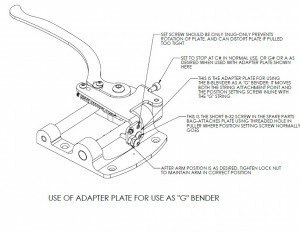 This won’t affect the attachment or function of the B-Blender, but it means that the spread of the strings is greater on the imported units, which must be allowed for when a bridge body has to be notched to utilize a Bigsby, in cases where the string would hit the body coming from the roller on the Bigsby to the bridge saddle. The difference from center to center of the outside strings is .094in greater for the imports. Incidentally, the US units are identified as B3,B5, B7, etc, while the imported ones are B30, B50, B500, B700, etc. The B-Blender will allow the player to add the ability to pull either the B string, or the G string to a higher pitch, generally a full tone for most users, although 1 ½ tones or ½ tone are also possible. At the same time this is being done, the normal vibrato action of the Bigsby is unaffected, and all 6 strings will have normal up and down pitch variation, as usual. If the string is pulled to a higher pitch, it will then have the same vibrato, except on the higher note. 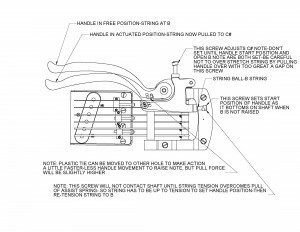 It has been argued for quite a long time, that this action would be impossible, since the spring of the Bigsby serves to balance the combined pull of all 6 strings. The theory was that raising one string, increasing its tension, would tend to flatten the remaining strings, since the spring would now be seeing more tension load from the B string. This would, of course be most noticeable if the string were merely raised, without vibrato being added. In the case of the B-Blender, this does not seem to be any problem. First, even when not desiring vibrato, you are holding the handle, and pulling it sideways to pull the string to a C#, which would tend to prevent it moving downward, toward the top of the guitar, and flatting the other 5 strings. Also, the Bigsby has a certain amount of internal friction, in the needle bearings on the main shaft as well as friction in rotation the hold-down roller on models like the B5, and it really doesn’t readily move on its own once all the strings are tuned up to pitch, and the stretch has stabilized. It should be noted that the B string, when pulled up to C#, will move .035 to .040 in at the string ball, and the normal string motion from the vibrato is only a few thousandths of an inch. The difference means that the B string must be allowed to travel much farther than the others, particularly around the hold-down roller on the B5 types, and over the B saddle on the bridge. I normally include a small C shaped bearing, made of a slippery plastic, to snap over the hold-down roller, if present, and sit between the string and the roller. This allows the string to slide around the bend, without trying to rotate the roller itself, which would be impossible, since it is being held by 5 strings, and rotating only the amount necessary for vibrato. The string can be oiled in place of the plastic bearing, but the oil soon is squeezed away and drag returns. Also, the bridge saddle should periodically get a tiny amount of lubrication, but this is not nearly as critical, since the contact area is less, and the wrap angle is much less.